Silly Bee's Chickadees: It Must Be My Lucky Month! 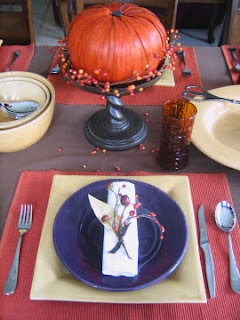 Just thought I'd spread the fun news...my photo of my Thanksgiving place setting was one of 10 winners (out of 130 entries) on marthastewart.com. My prize is Martha Stewart's Cooking School Cookbook. That is dang awesome. You go, you queen of craftiness you.